Kelly Barnhill's collection of stories is entertainingly subversive and often questions normative culture. Kelly Barnhill's body of work is fundamental to children's literature. Yet her most recent endeavor, Dreadful Young Ladies and Other Stories, departs from the standard. In this collection she pens bountiful fantasy short stories for an adult audience. These lyrical stories depict a widower who falls in love with a Sasquatch, a ghost affirming her paranormal identity, a young woman who can heal and commandeer bands of thieves, a professorially insect, and a magical young woman who leads a revolution against an oppressive state. These are just a few of the lush worlds Barnhill develops in the delightful and fun Dreadful Young Ladies and Other Stories. Barnhill applies description masterfully but sparingly throughout each story. She incorporates efficacious single phrases such as suggesting that love begins with acts of kindness. These lines develop the plot and characters, then transcend themselves into the reader's individual world. As another example, her description of fecundity in "Elegy to Gabrielle" as a blooming garden extenuated by the dark red juice of berries renders an alluring yet repelling image of birth. In "Notes on the Untimely Death of Ronia Drake", images of arms sliced by razors, or the descriptions of dead babies, represent the gruesomeness of the character's jealousy. In some instances these descriptions are tough to stomach but nonetheless engaging. Each short story is episodic, yet there's evident overlap between some of the texts. For example, Mrs. Sorensen is the main character in "Mrs. Sorensen and the Sasquatch", and she reappears in "The Taxidermist's Other Wife". Barnhill doesn't explicitly say this is the same character, however, there is a clue: Mrs. Sorensen hates the Taxidermist. His occupation contradicts her affective connection with the animal world thereby creating the premise for her hatred. In connecting characters and themes across stories, Barnhill is able to more fully develop the worlds in which they reside. Dreadful Young Ladies and Other Stories is entertainingly subversive and often questions normative culture. Perhaps this is best characterized by Mrs. Sorensen, who blissfully continues her relationship with the Sasquatch despite the prudish castigations of the Insufferable Sisters. But it's clear that Mrs. Sorensen's motivation is not salacious and she continues her romance as though it was completely commonplace. The questioning of normalcy is revisited in "The Insect and the Astronomer: A Love Story". Both the Insect and Astronomer try to assimilate but only alienate themselves further. Despite the pressure to adhere to the dominant culture, some characters are definitely confident in their magical abilities. The character Annabelle, when questioned about her non-normative behavior, asserts no one will control her or her abilities. The majority of the main characters are women or young girls, thereby challenging traditional literary modes. These characters are multidimensional, strikingly human, yet fully chimerical. Although classified as fantasy, Dreadful Young Ladies and Other Stories shares more similarities with the magical realism genre. All the stories are firmly embedded in a society that distinctively resembles our own. For example, the London Blitz is the historical backdrop for paranormal self-awareness in "Open the Door and the Light Pours Through". In "The Insect and the Astronomer: A Love Story", the setting's Capital City is familiarly metropolitan, while Vingus Country is distinctly rural. Moreover, crafting the main characters of this story as an insect and automaton only emphasizes the extraordinary, and is thereby reminiscent of Franz Kafka's The Metamorphosis. Throughout the collection, the magical and ordinary occur simultaneously in the lives of the characters. In "The Dead Boy's Last Poem", a young girl personifies teen love yet her heartbreak manifests through anthropomorphized poems. Finally, the character the Sparrow from "The Unlicensed Magician" best situates Barnhill's text as magical realism. The Sparrow exists in a society where she physically goes unseen, yet her magic is noticeable. Stretching the bounds of reality, the Sparrow and Dreadful Young Ladies and Other Stories as a whole, acknowledges that magic is inherent in our day-to-day life and it's just up to us to notice it. 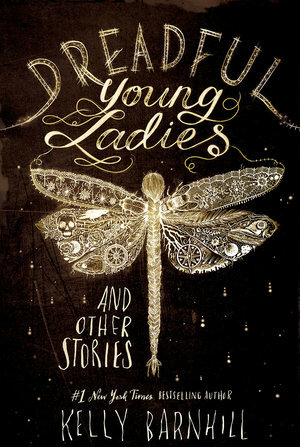 The longer stories in Dreadful Young Ladies and Other Stories, such as "Elegy to Gabrielle" or "The Unlicensed Magician", are the most engaging. The length of these stories allows the reader to fully indulge in the whimsy while being swept away by the adventure. The shorter stories, however, lack the plot and character development while the conclusions are abrupt. For example, in "The Dead Boy's Last Poem", "Notes on the Untimely Death of Ronia Drake", and even the "The Insect and the Astronomer: A Love Story", I found myself searching to understand the character motivations and oftentimes came up empty. Yet critiquing Barnhill's succinct short stories is just a roundabout way of saying I want to read more of her writing. Barnhill's work pushes beyond the confines of the fantasy genre and makes the reader want to believe that magic is part of our lives. Indeed the themes in this collection of short stories develop basic human responses such as love, death, and jealousy. But each story unfolds a darker and supernatural element to these emotions. Readers will easily identify with these characters and become engrossed in the mysteries of the supernatural.